The St. Louis Cardinals have made a late addition to their outfield a little more than a week into spring training. 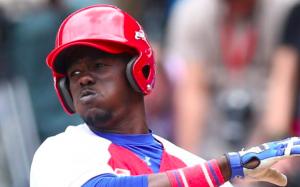 The team announced Friday it has signed Cuban outfielder Jose Adolis Garcia to a minor league deal with an invitation to spring training. The deal is reportedly for one year and worth $2.5 million. Garcia is the younger brother of Atlanta Braves third baseman Adonis Garcia. The younger Garcia reportedly left Cuba last August in hopes of pursuing a major league career. He was declared a free agent by Major League Baseball in December, opening the door for him to sign with any team. “As we continue to look for ways to add talent to the Cardinals organization, we are grateful for the efforts of (director of international operations) Moises Rodriguez and (director of player personnel) Matt Slater in helping us to do so,” Cardinals GM John Mozeliak said in a released statement. During a 90-game season in Cuba last year, Garcia hit .315/.395/.517 and was ultimately named MVP of the Cuban National Series. More recently, he struggled in a brief stint with a farm club in the Japanese League, hitting .234/.274/.396 in 117 plate appearances. Garcia has also been a star for the Cuban National Team. He was the team’s center fielder during the 2015 Pan American Games, hitting a walk-off home run to help deliver Cuba the Bronze Medal. Losing him for the upcoming World Baseball Classic is considered a big blow for Cuba’s chances. Scouts view the 24-year old Garcia as a player with great tools who could still use some refining. In April 2015, Baseball America ranked him as the 20th best player in Cuba. He’s listed at 6′ 1” and 180 lbs. and is believed to have the speed and athleticism to play center field in the majors. He’s described as having plus speed and plus-plus arm strength. However, scouts have also commented that his swing is rather long and he lacks plate discipline, flaws that may have been exposed during his brief stint in Japan. Nevertheless, the Cardinals are taking a chance on him. St. Louis has reportedly been looking for a way to boost its outfield depth leading up to the season. Even though most scouts believe Garcia will need a minor league assignment at double-A or triple-A at the start of the season, he will be in big league camp with the team and have a chance to play his way onto the roster. The St. Louis outfield appears to be set heading into the season, with Dexter Fowler in center field and Randall Grichuk and Stephen Piscotty handling the corner spots. However, the Cardinals appear less than enthused about their outfield options behind those three. Tommy Pham, a strong defensive player who hit just .226 last season, appears to be the top candidate for the fourth outfielder job. The only other serious outfield candidate is Jose Martinez, a 28-year old with just 16 big league at bats to his name. It’s a stretch to think that Garcia will be on the opening day roster or solve the problems St. Louis currently has with regard to outfield depth. But his raw tools and success playing in the Cuban League make him an intriguing player to watch this spring. If he can quickly adjust to playing stateside, he may be a player who can help the Cardinals during the second half of the season.